In those seemingly interminable refugee debates being held in various countries, cruelty is pure theatre. It is directed, stage managed, the victims treated as mere marionettes in a play of putrid public policy and indifferent public officials. Barriers have been set; barbed wire has been put in place. Open zones such as the European Union are being internally bordered up, the principle of mobility derided and assaulted. In all of this, Australia has remained a paragon to be emulated. It first began with tentative steps: the establishment of onshore detention facilities at Villawood, Sydney and Port Headland, Western Australia, in 1991. Then came that vile concept of mandatory detention, introduced in 1992. The hobgoblin of offshore detention, financed afar by the Australian tax payer, would come with the Howard government. The worded rationale since the Hawke years has tended to follow variants of the same, only differing in terms of shrillness and savagery. “Australia,” came the grave words of the Hawke government, “could be on the threshold of a major wave of unauthorised boat arrivals from south-east Asia, which will severely test both our resolve and our capacity to ensure that immigration in this country is conducted within a planned and controlled framework”. The list of obituaries arising from such a policy is growing and should be chiselled into a wall of remembrance. There is the Kurdish-Iranian refugee Fazel Chegeni, who perished on Christmas Island in November 2015 after escaping the North West Point detention centre. His state of mental deterioration had been documented, along with three reported attempts at suicide. There is the youthful Hamid Kehazaei, who succumbed to sepsis after his request for a medical transfer was sternly refused, only to then flounder before the overgrown resistance of Canberra’s bureaucracy. The details of his maltreatment laid before the Queensland coroner Terry Ryan have proven to be kaleidoscopically torturous: the refusal to supply intravenous paracetamol for two nights in a row; suffering hypoxia; being left unsheltered at the airfield un-sedated. 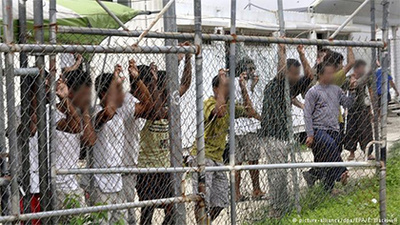 The case of Manus is particularly grotesque, given the decision made by the Papua New Guinea Supreme Court in 2016 that detaining people indefinitely was decidedly illegal, a constitutional violation of personal liberty. Those facilities replacing the camp have done little to arrest the decline of health of the remaining population. Farce became tragedy when a call by a staff member of the Asylum Seeker Resource Centre to Salim’s spouse revealed, prior to any notification from Australian officials, that her husband had committed suicide. The worker in question, a certain Kon Karapanagiotidis, was, by his own admission “lost for words”. What is in place in Australia’s singularly styled gulag is a measure of calculated degradation, a brutal hierarchy of violence manufactured to defeat the spirit and aspiration of the UN Refugee Convention. Few countries of the nominal democratic world have been so avidly dedicated to this cause, citing counterfeit humanitarian considerations even as the noose – quite literally – is being tightened. Medical care in acute situations is being refused, notably when it requires treatment that would only be possible on the Australian mainland. The oldest Afghan Hazara held on Nauru, one Ali, is said to have advanced lung cancer. He is being housed at the Australian-built RPC1 camp, a woefully inadequate, threadbare facility which is bearing witness to his last days. Doctors have had the ear of the Australian Border Force, but the establishment remains stony towards calls for help. The Department of Home Affairs has preferred to remind Ali that he best shove off his mortal coil back in Afghanistan. The growing list of deaths, the burgeoning number of psychological wrecks, the casualty list in what can only be deemed a planned campaign against refugees and asylum seekers, is such that even the extreme centre, the Australian consensus approving such treatment, might be changing. As ever, such moves stem from the left wing of the party, those condemned as bleeding hearts or soggily wet with teary sentiment. But in federal parliament, refugee advocates could get some hope at the remarks made by Labor MP Ged Kearney, fresh from her by-election victory in the Melbourne seat of Batman. Psyches captive to the police mentality that afflicts Dutton and government front benchers happily tolerate such ongoing costs. As would many of those on the opposite of the aisle. For such political creatures, deterring refugees who arrive outside that planned controlled framework stated by the Labor government of the early 1990s is not merely a job but a duty.